I did a lap of Meijer and Walgreens and picked up a few items. Walgreens has a coupon on their website good for today only for a free tote and 15% off regular and 20% off Walgreens brand items. At Meijer, I bought the 3-pack of pure glycerin soap I had twittered about last week. $2.99. 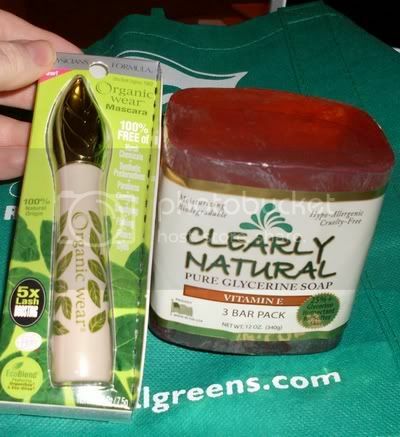 I also found Physician's Formula Organic Wear mascara on sale for $5.36. I had a $5 coupon so that was 36 cents. Yeah, boy! It's really cute with a green leaf top. Fragrance free. 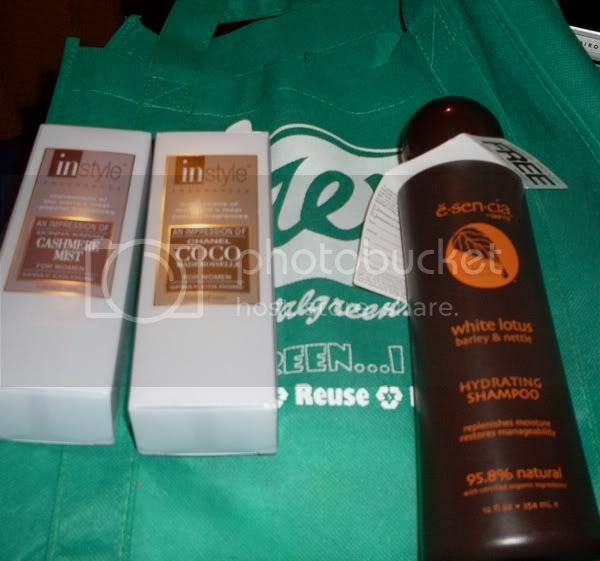 At Walgreens, I picked up the freebie tote, the Escencia Shampoo I had posted about a few weeks back. Those products have hang tags where you can get your purchase price back after rebate. $7.99. My last chemical dependency is perfume. The InStyle perfumes are B1G1F this week. $11 for the two. Your blog is awesome! Thanks for sharing your reviews :) I was wondering if you have tried Josie Maran's cosmetic line & also Tarte products. I read somewhere that both are suppose to contain natural/organic ingredients. I believe they're sold in sephora.